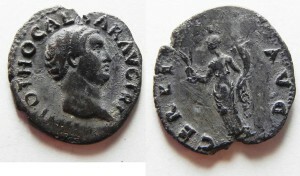 Marcus Salvius Otho, with the support and aid of the Praetorian Guard, had his predecessor Galba murdered in January and claimed the throne. Legate Aulus Vitellius, governor of the province of Germania Inferior, had also claimed the throne earlier in the month and marched on Rome with his troops. 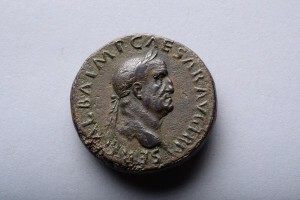 Vitellius’ forces were divided into two armies, one commanded by Aulus Caecina Alienus and the other by Fabius Valens. The Vitellian forces included legions XXI Rapax, V Alaudae and powerful vexillationes from all the other legions stationed on the Rhine, together with a strong force of Batavian auxiliaries, a force of around 70,000 men. The forces commanded by Caecina crossed the Alps by the Great St. Bernard Pass to reach northern Italy. They attacked Placentia but were repulsed by the Othonian garrison and fell back on Cremona to await the arrival of Valens‘ army. Otho left Rome on March 14 and marched north to meet the challenge, leaving his brother Titianus in charge of Rome. He made his base at Brixellum. His forces included legions I Adiutrix, XIII Gemina, a forward detachment of XIIII Gemina, the Praetorian Guard and a force of gladiators. His general staff included generals such as Gaius Suetonius Paulinus, who, as governor of Britain, had defeated Boudica eight years before but Otho decided to call his brother Titianus from Rome to act as his commander in chief. Before Titianus arrived, one engagement had already been fought. Caecina tried to set an ambush at Locus Castorum, a village about half way between Bedriacum and Cremona on the Via Postumia. The Othonians were warned and their army marched for Locus Castorum, led by Suetonius Paulinus. The Othonians had the better of the fighting and Caecina’s troops retreated to Cremona. Here they were joined by Valens’ army, which had followed a longer route through Gaul. Titianus had now joined the Othonian armies and took command. It was decided to march on Cremona to give battle, against the advice of Paulinus and other generals, who wished to wait until other legions, had arrived. Otho remained at Brixellum to await the outcome. On 14 April the two armies met on the Via Postumia, nearer Cremona than Bedriacum, with the Othonian troops already tired after a long march. Some of the heaviest fighting was where Otho’s 1st Adiutrix legion, recently raised from the marines of Classis Ravennas at Ravenna, clashed with Vitellius’ veteran Rapax. The Adiutrix acquitted itself well, capturing the eagle of the 21st, though its commanding officer was killed as the 21st strove to recover it. Elsewhere on the battlefield, Otho’s 13th legion was defeated by Vitellius’ Alaudae and the Adiutrix eventually gave way when a force of Batavian auxiliaries took them in the flank. 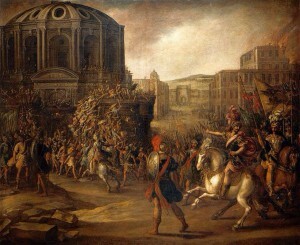 According to Dio Cassius about 40,000 men were killed in the fighting. The Othonian troops fled back to their camp in Bedriacum and the next day surrendered to the Vitellian forces and took the oath of allegiance to Vitellius. When news of the defeat was brought to Brixellum, many of Otho’s troops urged him to fight on, pointing out that more troops were on the way but Otho chose suicide rather than cause more deaths. He had been emperor for fewer than three months; Vitellius continued his march on Rome, where he made a triumphal entry and was recognized as emperor by the Senate.